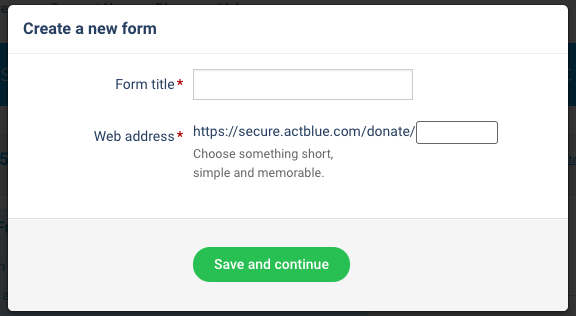 The first thing you should do once you’ve set up your ActBlue account is create a contribution form to be used on your website or in your fundraising emails. You can create as many custom contribution forms as you’d like -- it only takes a few minutes! 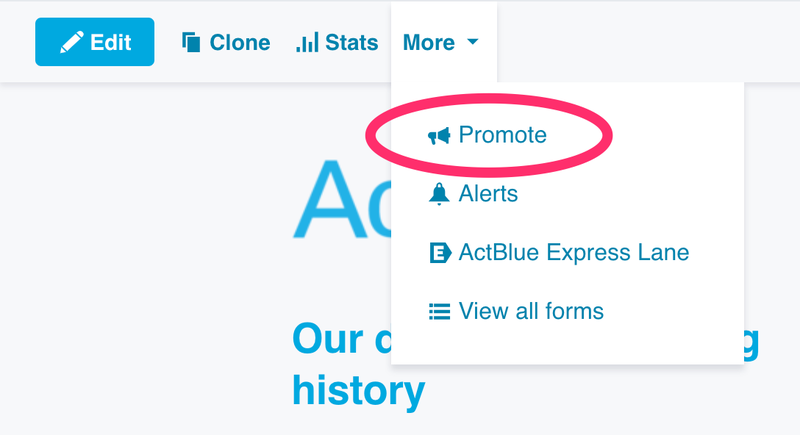 Note: This guide is for admins of campaigns and organizations on ActBlue. If you are a supporter or organizer, visit our Guide to Community Forms. 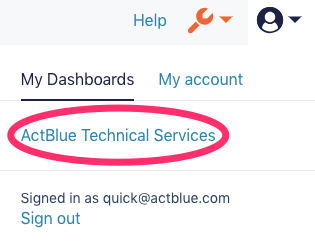 Once you’ve logged in to ActBlue, open the User menu in the upper right-hand corner of your page. You'll be brought to the “My Dashboards” tab. Visit your group’s Dashboard by clicking on the appropriate organization within the menu. Then click the “Create Form” button in the left-hand corner. 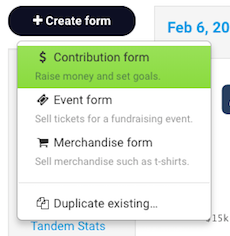 Once you click the "Create Form" button, you'll be given the option to create a contribution form, an event form, or a merchandise form. Be sure to select the option for contribution forms. A pop-up will open where you will fill out your form’s basic information. First, give your form a title. You will be able to edit your form’s title later, so don’t worry if it is not perfect. Then finish the web address for your form by typing a short, simple, memorable word in the “Web address” box. This word (or phrase) will not only be part of the unique web address for your form, it will also be the name of your form in your ActBlue Dashboard. Pick a short word or phrase and make a note of it so you can locate your form in the Form Management tab quickly. When you click “Save and continue,” you will be taken to your contribution form. The form editor will automatically be open on the left so that you can start customizing your form right away. Next we’ll go over how to use the form editor, but make sure you keep reading after that to finish setting up your form! The form editor lets you preview your changes in real time! The form editor includes all of the tools you need to customize and promote your form, from changing the text to customizing donation buttons and recurring settings. 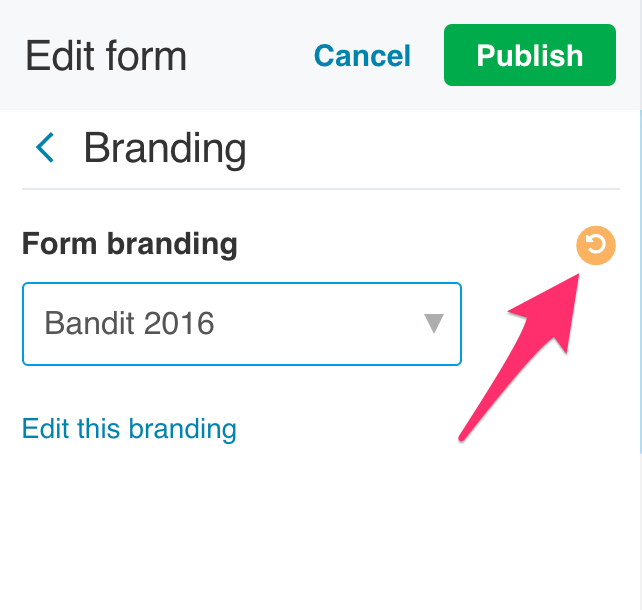 When you make a change using the form editor, a small reset button will appear next to the field you edited. If you want to undo that specific change, just click this button. If you make a change in one tab of the form editor and then go back to the main menu without publishing, an orange dot will appear next to the tab name in the main menu to help you keep track. This way you can make multiple changes across tabs in the editor, and when you click “Publish” all of those edits will go into effect. If you have unpublished changes and are on the main menu, clicking the “Cancel” button will get rid of all of the changes you have made across tabs. After you press “Publish” and close the form editor, you’ll be brought back to your form with the form navbar at the top. From the form navbar, you can: open the form editor, access the form's Stats page, clone your form, promote it using refcodes and links, set contribution alerts, create ActBlue Express Lane links for your form, or go to the list of all of your contribution forms. Once you’ve created your form, the first thing to do is add a donation ask. Go to the “Title, ask, and URL” tab in the form editor. In the "Donation ask" box, write a short blurb explaining why a supporter should donate. Being specific about why you need the money and what you’ll use it for will help motivate your supporters to give. You can add basic formatting like bullet points and bolding, as well as add images. If you want to add HTML, click the "</>" button before typing your code. To add an image, click the picture icon and then just select an image from your computer. Creative control is awesome, but remember that when it comes to text on your forms, less is always more. You want to make sure it won’t take someone who is viewing your form on their phone too long to read your ask (40% of all contributions are made on mobile!). Test your form on your own phone to see how it looks. Once you’ve added content to your form and published it, go back to the main menu of the form editor and select “Preset donation amounts.” Here you can also choose what contribution buttons appear on your form. Donors will always have the option to type in their own amount, but it’s a good idea to make sure that the amounts that appear on the form are in line with the type of supporters you’re targeting. 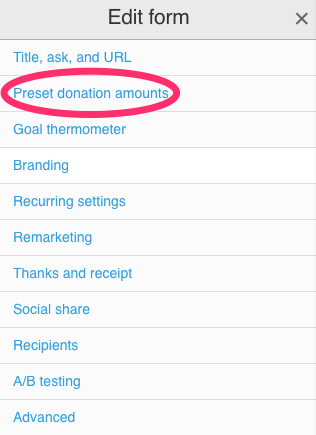 Presetting donation amounts will make it easy for your donors to quickly choose an amount, as you can see below. For more help setting up preset donation amounts, click here. 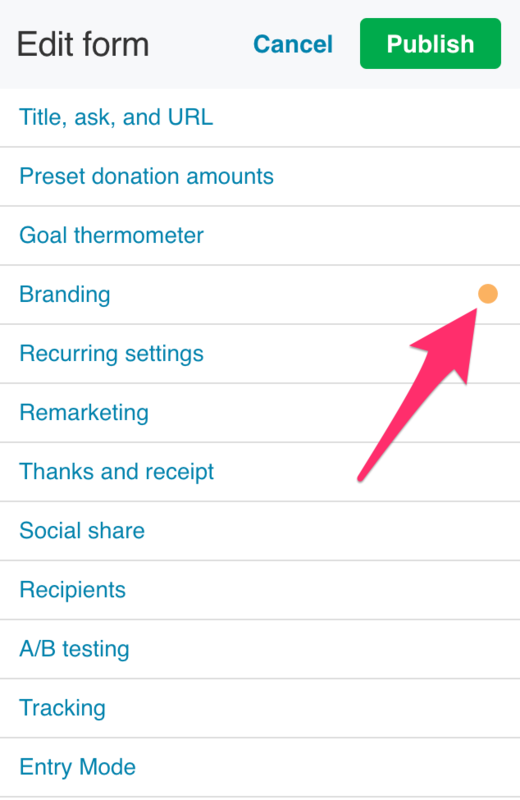 The next tab in the form editor is for a Goal thermometer. Go here if you want to add a thermometer to your form so donors have a visual representation of your progress. In the “Branding” tab, you can add one of your group’s designed templates to your form. These templates can include logos and images so that your form reflects your brand identity. Below is an example of a contribution form with custom branding. If you haven’t created a branding for your campaign or organization, we make it easy for you. You can find out how to create your own branding with your group’s colors and logo here. 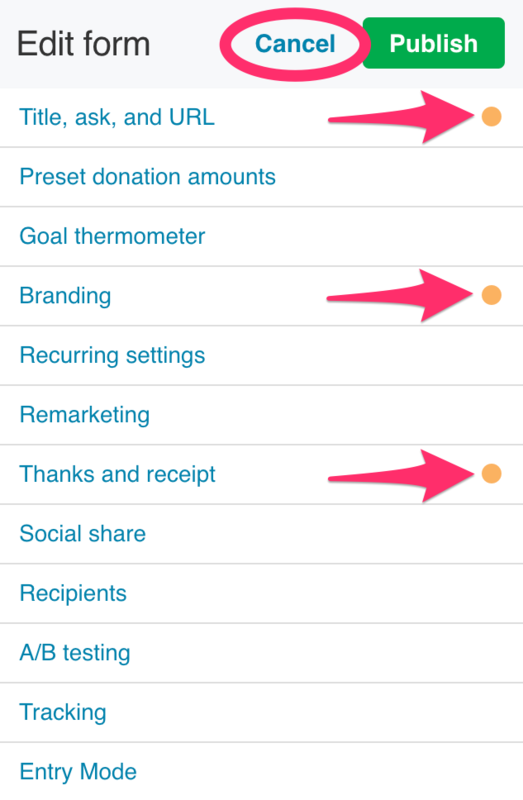 Go to the “Recurring settings” tab to change the recurring contribution settings for your form. Important: As a default, your form will be set up to accept unlimited monthly contributions. It will also automatically use pop-up recurring asks with a threshold of $101: This means that after a supporter gives a one-time contribution that is less than $101, a pop-up box will appear that asks them to make their donation recurring. You can easily change both of these settings in the “Recurring settings” tab! To change the pop-up ask threshold, just enter a different dollar amount in the “Pop-up recurring ask threshold” box. To turn off pop-up recurring asks, enter “0” in the box. Go here to learn more about pop-up recurring asks. Instead of unlimited monthly contributions, which can recur as long as a donor wants to remain a monthly supporter, you can choose to use monthly contributions that recur for a specified amount of time. You can also choose to use unlimited monthly recurring and smart pop-up recurring together, which will show one-time donors a pop-up prompting them to commit to a monthly contribution amount that is smaller than their initial contribution. You can read more about smart recurring here. You also have the option to disable recurring contributions on your form. Learn more about recurring contributions here. In the “Remarketing” tab, we’ve made it easy for your campaign or organization to follow up with visitors who landed on your form but didn’t actually complete their contribution. The remarketing feature ensures donors who abandon your form before completing their donation will automatically receive an email thirty minutes following their incomplete donation. So, if a donor selects a contribution amount and fills in their email address, but leaves the page before going on to fill in their credit card info, we’ll make sure they get a reminder with a link to your form asking them to complete their contribution. Remarketing is enabled by default on every ActBlue form (except for Tandem forms, which can't use this feature). If you want to learn more about remarketing or how to turn it off, just follow this link. In the “Thanks and receipt” tab, write a short thank you note for donors in the "Email receipt text" box and make them feel like they’re a part of your movement. 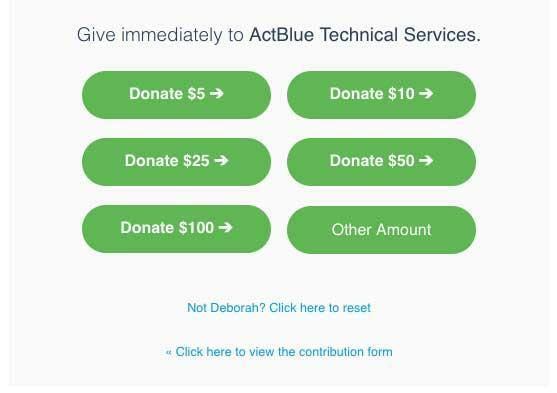 Your message will be added to the top of the automated receipt sent via ActBlue after a donor makes a contribution. There are other features that you should consider using in the form editor, but once you’ve set these up (and published your changes!) your form will be ready for donors. To send your contribution form out to the world, just copy the link that’s generated at the top of the “Promote” pop-up and paste it in an email, on your website, or anywhere else you’d like to fundraise. 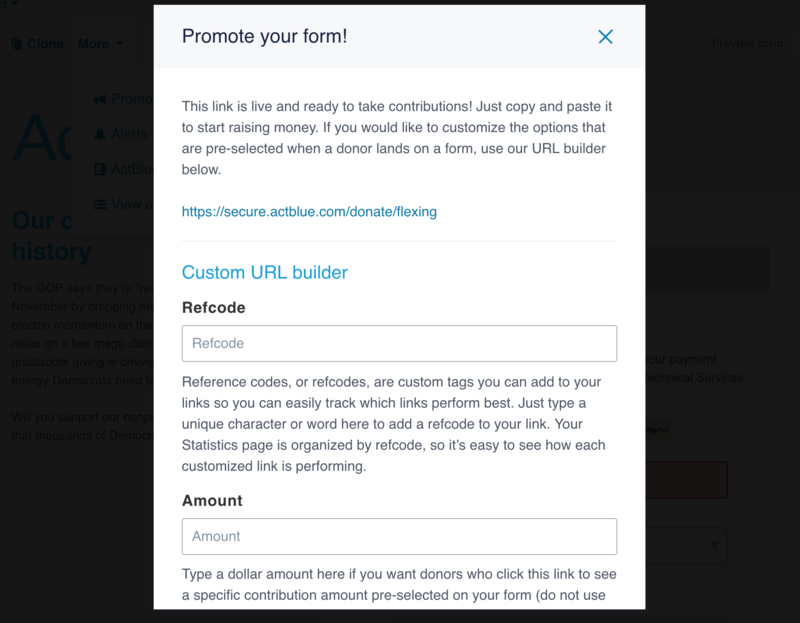 If you’re planning on using reference codes to track your donations (and we think you should), read our guide here. 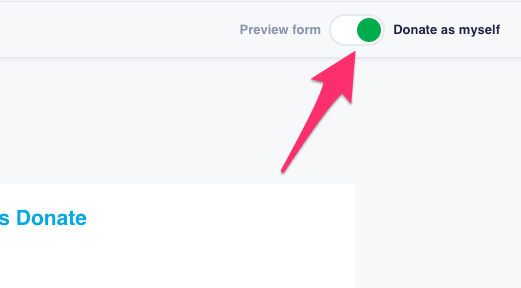 To find your form, go to the Form Management tab in your Dashboard and click on its name to open the form menu, or click the “Edit” button to the right of your form’s name to open the form editor right away.